A couple of months ago we spoke about copyright protection for clothing designs. Now it’s time to talk about shoes and trademarks. Converse, the maker of the ubiquitous Chuck Taylor All Star sneakers, filed lawsuits against thirty shoe manufacturers, importers, and retailers over the last two years alleging trademark infringement of its shoe design. Converse sought a general exclusion order from the International Trade Commission preventing the importation of any shoe with its design elements. These are protected by three separate trademarks, two of which relate to patterns on the sole of the shoe and one concerning the toecap and mid-sole design. 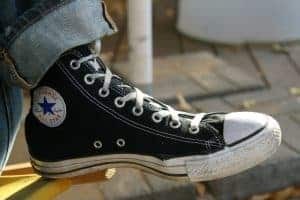 This past July, the International Trade Commission surprisingly ruled that one of Converse’s trademark registrations was invalid. According to the ITC, the covered elements, a toecap and stripes on the mid-sole, did not meet the requisite secondary meaning under trademark law. While the ITC held that Converse does have valid trademarks in the designs on the sole of the shoes, that ruling likely gives little solace to Converse. The Converse case – which no doubt will be appealed to the Federal Circuit – highlights yet again the difficulties fashion designers and manufacturers face in seeking to protect their intellectual property. Join Kandis Koustenis and Jennifer Atkins as they discuss the Converse case, the requirements of secondary meaning, and the various tools available for protecting fashion designs.